AMAZING Downtown Waterfront with Lake View Beach Access & Boat Moorage. The sunset Waterfront Resort has one of the best locations in all of Kelowna. Located on the downtown waterfront you will have amazing views and will be in close proximity to shops, restaurants, events, parks and the beach. This is a high demand family friendly property so be sure to book early. Boat moorage is an extra fee of $35.00 per night. This 3 bedroom, 2 bathroom lake view condo sleeps a maximum of 8 people and has a 3 night minimum stay requirement in May and June and a Weekly stay requirement with a Saturday arrival in July and August. Take a look at our guest reviews and you will know that we take a great deal of pride in our property and making sure our guests have a terrific vacation. We are continually improving the property and its furnishings to ensure that it exceeds our guests standards of both quality and cleanliness. Recent remodel completed in Jan 2019. The kitchen includes a full complement of high-quality cook-ware, dishes and more. The kitchen includes a full size refrigerator, full size range with natural gas cook top, microwave, dishwasher and double sinks. The dinning area consists of a large table and a kitchen bar. Together they can seat large groups of up to 10 people. The dinning area, living and kitchen area are all very open with plenty of light. The living area has dark leather furniture with solid wood accent tables. The double sofa bed can sleep 2 additional guests for larger groups. The Master Bedroom has a view of the lake, its own private deck and bathroom. The King bed has a pillow top mattress with down duvet. The master shower is amazing, custom wall tile, natural stone floor and high volume spray. The 2nd bedroom has a queen bed with a pillow top mattress and down duvet. The main shared bathroom is just across the hall. The 3rd bedroom is rather unique. We had this bed custom built with a full queen on the bottom and a twin up top. This is a great room for the 3rd couple or families with children in need of a little extra sleeping space. The condo has a full size front load washer and dryer. We supply all the linens, towels and beach towels for your use. Nothing cooks like the Weber Genesis BBQ. Its connected to natural gas and always ready to go. The living room and each bedroom have HDTVs with blue ray players and Netflix access. Enjoy a movie or your favorite show from any room. Sunset Waterfront Resort offers beach and lake views. Our building is green, we have a geothermal heating system to provide both heat and air conditioning. We have a single parking stall in the building. Additional parking is available on out front or at prospera place. We have high speed cable internet. This condo is on the same floor as the outdoor pool and tennis courts. We have a boat slip for rent the cost is $35 per night or $250 per week for guests only. We have a main deck off the living room and a small deck off the master bedroom. You can bring your boat or rent a boat near by. Big White Ski Hill is only 40 miles away. The tennis courts are on the same floor as our condo. Kelowna has many great places to golf. There is a steam room. The pool is private to the resort but shared among guests from different units. Loved this condo perfected located on the water in downtown. The third bedroom allowed 5 family members to visit on our holiday in Kelowna. We would absolutely rent here again. 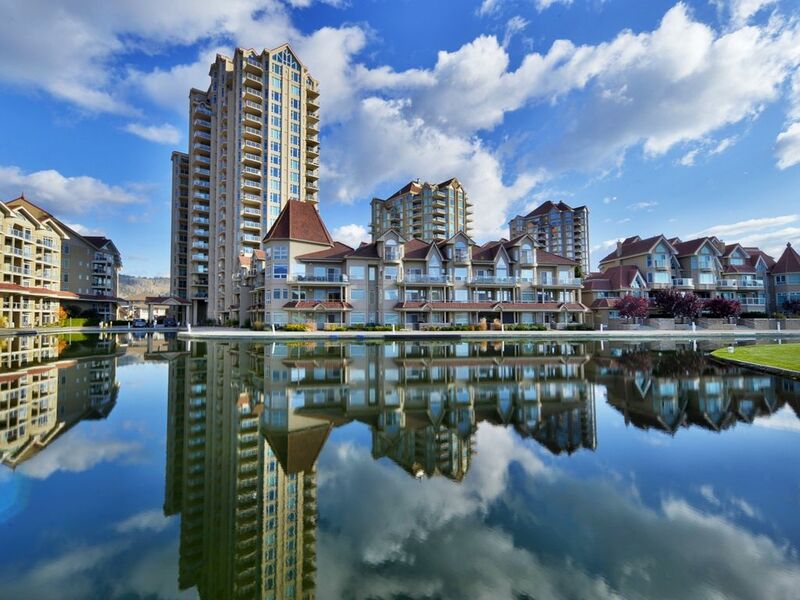 The Sunset Waterfront Resort is located downtown in the heart of Kelowna. When you stay at the Sunset waterfront Resort you will enjoy amazing views, access to the sandy beach, strolls along the waterfront boardwalk, dinner at near by restaurants and live entertainment just steps from your front door. Once in your car golf courses, wineries, the Kettle Valley Railway and the Big White Ski Resort are just a short drive away. Kelowna is a recreation mecca where millions come to create lasting memories with family and friends. Your are going to love it!